Can you believe it? 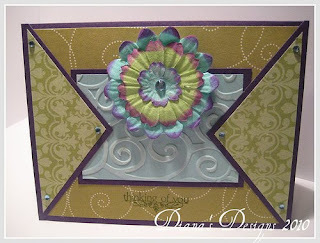 I actually found time to whip up a card. No joke! My son finally let me have 7 hours of interrupted sleep for the first time in 2 weeks and woke me up at 5am. My daughter was still sleeping which meant that my son could play quietly on his own without the worry of having to fight over his new toy, a Harley Davidson trike complete with working lights and sound effects. It's my friend's birthday tomorrow so I really wanted to make her a card. 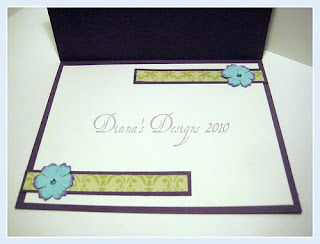 I sent her one last year PC (pre-Cricut) that was very simple where I used a mini flower craft punch. That is actually what sent the ball rolling and landed me in Cricut heaven. Had I not sent her that card a year ago, I probably would not have rekindled my passion for cardmaking and I probably would never have bought a Cricut. So it would not feel right if I didn't send her a Cricuted card this year. For my inspiration, I chose this week's sketch at CPS. I really love what the designers have come up with so far. 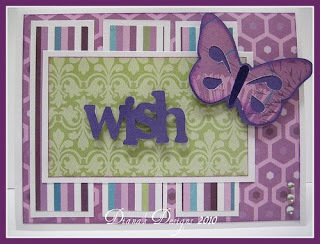 I used my new stash of designer paper, a 1 1/2" butterfly cut from the Stamping cartridge backed with a shadow, and the word "WISH" from the same cart cut at 1". I popped up the sentiment and added some bling I found at the dollar store. I wish I had time to fancy it up some more but alas, it was time to get me, and the kids, ready for school. Boy, I missed my Cricut!